Good morning everybody. There are so many things that I should have been doing over the last couple of days but I got a little distracted which is so unlike me (not). I finally made the decision to buy 28 count black evenweave fabric for the Cirque des Cercles design mentioned in my last post. I’ll be stitching it in DMC shade 111. I may live to regret using black fabric but my trial with my tiny LED reading lamp clamped to the embroidery frame worked a treat. In fact, after a while I didn’t seem to need the light and was working by feeling the underside of the fabric with the needle. Materials ordered online take time to arrive, especially at this time of year, so how could I possibly resist lifting a little motif from the chart and stitching it as my trial on royal blue fabric? So now I have a lovely card in my stash to send to someone this year. 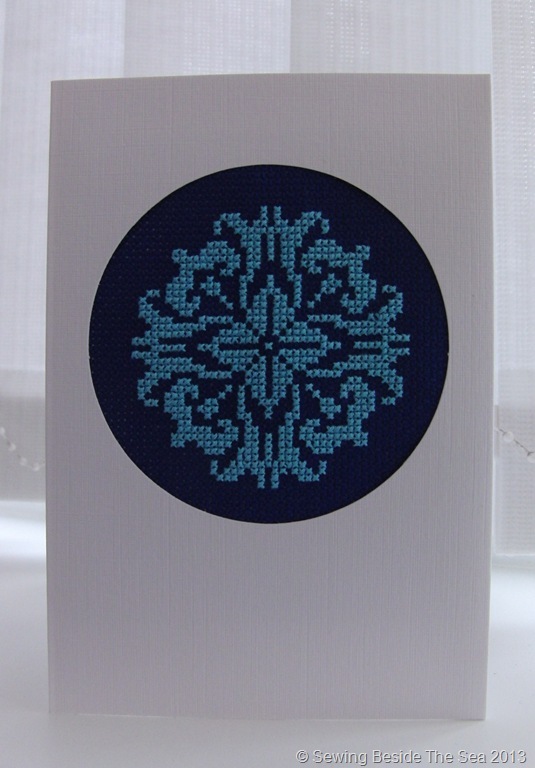 I used pale blue thread on royal blue aida. I can’t wait to get started on my new project with Claire! The card looks wonderful Avis. The dark background really makes the stitching stand out. Now why would you want to do anything else other than crafty things at this time of the year? Have another lovely crafting year and keep writing your blogs, they are fun and interesting to read, not to mention all the hints and ideas. Ha-ha! Exactly, why do boring snoring things when there is sewing to do instead? Don’t worry, I love writing as much as I do reading all the other wonderful blogs. Trouble is, there is far too much inspiration out there 😆 Thank you for all of your support and Happy New Year to you! can’t wait to see how this masterpieces will look like..
you’ll find black evenweave slightly more challenging than aida but I know you’re going to enjoy yourself. Thanks Carole! I’ve just received an email. My next project has been dispatched YIPPEE! !